QuantumScript™ HD Reverse Transcriptase is an engineered version with increased sensitivity, improved specificity and maximum thermostability. QuantumScript™ HD Reverse Transcriptase has been engineered to have a longer half life at 50°C, which enables its ability to process longer RNAs with more complexed secondary structures. Enhanced thermostability of this enzyme is obtained through re-engineered RNA-based DNA Polymerase domain and the fusion of a novel RNA-interacting surface domain at the RNase H domain site. 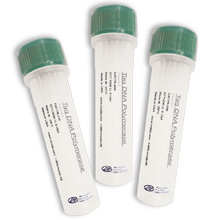 The enzyme is purified to homogeneity to ensure high thermostability, specificity, fidelity, yield, and more full length cDNA synthesis that the premium reverse transcriptase provides. The optimal fist-strand cDNA synthesis temperature for this enzyme is 50°C, and it has a broad working temperature range from 37° C to 55° C, with cDNA product size from 100 bp to 12 Kb. 20 mM Tris-HCl (pH 7.5), 1 mM DTT, 0.05% (v/v)Triton X-100, 0.1 mM EDTA, 0.1 M NaCl and 50% (v/v) glycerol. One unit of the enzyme incorporates 1 nmole of dTTP into acid-precipitable material in 10 minutes at 37˚C using poly (A):oligo (dT)25 as template-primer. This enzyme has passed the quality control assays: SDS-PAGE analysis for purity, functional absence of endonuclease activities, functional absence of exonuclease activities, functional absence of protease activity. 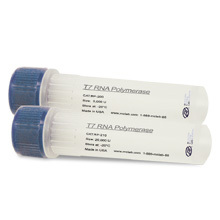 The following procedure uses 10 pg to 5 µg of total RNA or 10 pg to 500 ng of mRNA. In a sterile RNase-free microcentrifuge tube, add primers (200-500ng of oligo(dT)12-18, 50-250ng of random primers or 2 pmol of specific primers). Heat the tube to 70° C for 5 minutes and incubate on ice for 1 min to denature any possible secondary structures within the template. Spin briefly to collect the solution at the bottom of the tube. Add the following components to the annealed primer/template in the order shown. Note: Do not alter the ratio of primer to mRNA. Mix gently. For random primers, incubate tube at 25°C for 5 min. Perform first-strand synthesis at 55°C for 30-60 min. Reaction temperature may be optimized between 50°C-60°C for difficult template with high secondary structure. Inactivate the enzyme by incubation at 70°C for 15 min. When perform PCR amplification after step 4, removal of RNA is highly recommended prior to the PCR amplification to ensure the yield of PCR product. 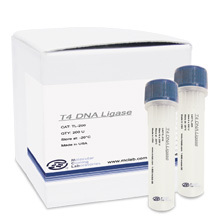 Addition of 2 units of RNase H (Cat. # RNHE-100, RNHE-200, RNHE-300) and 20 min incubation at 37°C is recommended for the removal of RNA. Standard protocols for second-strand synthesis may be found in reference 2. Note: The 5X Reaction Buffer is compatible with enzymes used in a number of downstream applications. Typically there is no need for phenol extractions or ethanol precipitations using this protocol before any PCR amplification. Roth, M.J., Tanese, N. and Goff, S.P. (1985) Purification and characterization of murine retroviral reverse transcriptase expressed in Escherichia coli. J. Biol. Chem. 260, 9326–35. Sambrook, J., Fritsch, E.F. and Maniatis, T. (1989) In: Molecular Cloning: A; Laboratory Manual, Cold Spring Harbor Laboratory, Cold Spring Harbor, New York, 8.64.